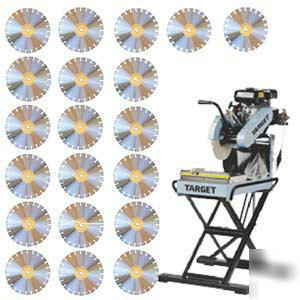 With this package you purchase 20 of the Diamante Italia Brand Supreme Grade 14" Diamond Blades and receive a FREE TARGET M50109 Portasaw Brick saw! This saw sells for $1949.90 itself, so this is an amazing deal. These 14" segmented blades are Made by Diamante Italia and are laser welded combination blades made for cutting brick, block or concrete on either a high speed saw or a brick saw. These blades feature a segment that is .125" thick and 1/2" tall, with more diamond than other 14" masonry blades - that's why this is our SUPREME! These are without a doubt the least expensive, highest quality blades you will find! We sell these blades at a discounted $209.90 each so 20 = $4198.80 which is the cost of this entire package! M50109 14" portable brick saw features an open-back design allowing for larger material to be cut - you can pull an 8x8x16" block right out the back of it! Thise 5 1/2 horsepower engine is made by Honda, so you can be assured you are getting top quality stuff!